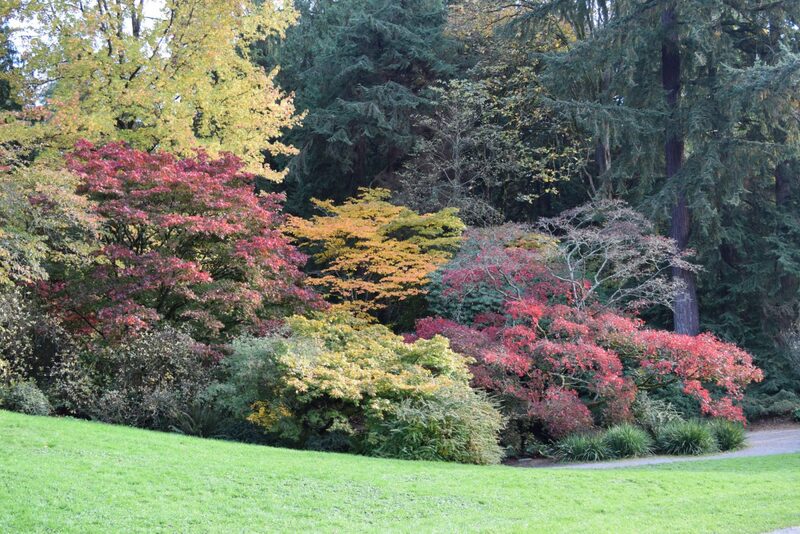 The Arboretum is one of the best places in Seattle to enjoy fall color and beautiful foliage. 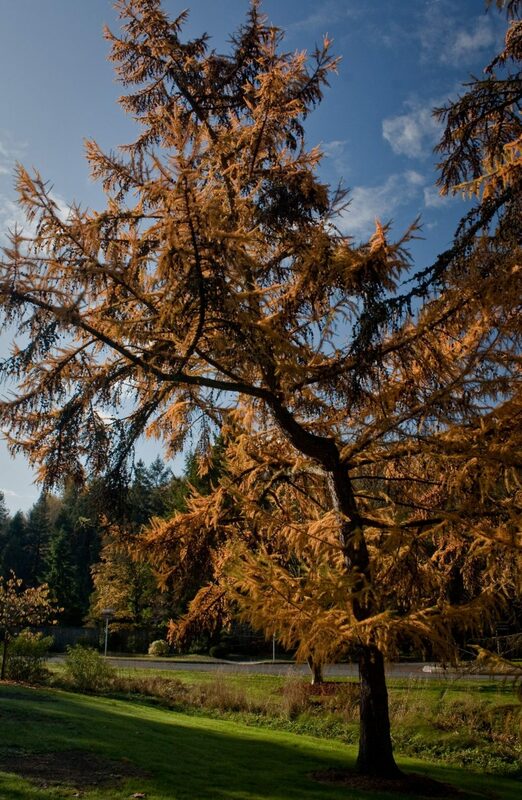 We have more deciduous tree species than any other setting in the northwest…all framed by the majestic conifers that characterize our region of the country. The Woodland Garden offers perhaps the most stunning display of fall color anywhere in the region. 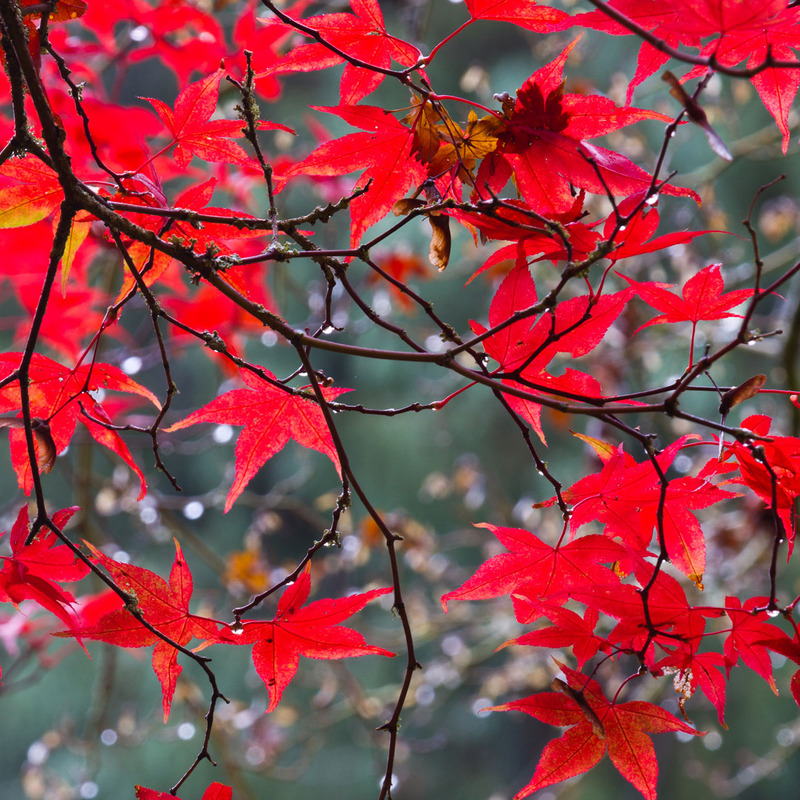 With one of North America’s largest collections of Japanese maples anchoring the display, you’ll see vibrant yellows, intense oranges, deep reds and even magenta and purple leaves set off against a backdrop of native conifers and rhododendrons. Not to be outdone are the fiery shades of the large shrubs Fothergilla major (witch alder) and Hydrangea quercifolia (oakleaf hydrangea). Seventy year old Oxydendrum arboreum trees (sourwood) add another layer, intermediate to the towering Cercidiphyllum japonicum (katsura) trees behind them south of the upper pond. The yellow, gold and even purplish of the katsura leaves smell like burnt sugar in the fall. The Lindera obtusiloba (Japanese spice bush) have clear yellow leaves that brighten any gray day. Elsewhere in the Arboretum, the witch hazel family area (Hamamelidaceae) east of the Pacific Connections garden features leaves of Corylopsis species (winter hazel), Hamamelis species (witch alder), and Parrotia persica (Persian ironwood), Fothergilla major (witch alder) species in shades of yellow, orange and red, as well as the brilliant red-purple of Disanthus cercidifolius (redbud hazel). Just to the south in the Camellia section are some of the best fall coloring trees, the Stewartia, with foliage of cinnamon orange, red or deep claret depending on species. The Franklinia alatamaha (Franklin tree), adds white camellia-like flowers to the show, set off by red and orange leaves as they change from their summer green. Rhododendron Glen contains towering Metasequoia glyptostroboiodes (dawn redwood), whose soft coniferous foliage turns gold before carpeting the understory vegetation. Along Arboretum Drive you’ll find magnolias and and Sorbus (mountain ash) in varying shades of yellow, orange and scarlet, and in the case Sassafras albidum var. molle (sassafras) all of these colors on one plant. Along Azalea Way, many of our flowering cherries (Prunus spp.) have excellent color and you’ll also see impressive Carya ovata (shagbark hickory) and many dogwoods (Cornus spp.) and maples (Acer spp.) lining the route. Catch glimpses of Nyssa sylvatica (black gum) and Larix spp. (larches, a deciduous conifer) turning color. Our Asiatic maple (Acer species) section shows the diversity of leaf shape and autumn color in the genus. The oak section (Quercus species) features copious leaf fall from majestic trees as the colors change. Throughout the Arboretum our native vine maples (Acer circinatum) are found in yellows and oranges and the majestic bigleaf maples (Acer macrophyllum) are often a muted gold. No matter where you turn, fall is a magical time in the Arboretum. The best colors are usually found in mid-late October, but the show begins in September and lasts until November. Fall rains cause the water features in Rhododendron and the Woodland Garden to flow gently again. Be sure to visit throughout the season!